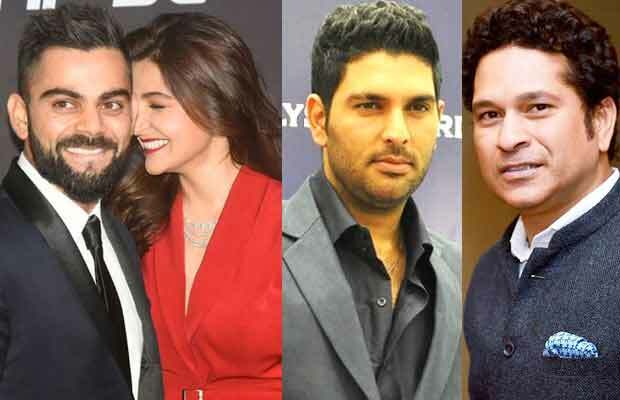 Anushka Sharma and Virat Kohli’s Italy wedding guest list includes only two cricketers! Wedding bells are ringing for Bollywood actress Anushka Sharma and Indian Cricket Team Captain Virat Kohli! Virat-Anushka along with her family have flown to Italy. Virat and Anushka will say their ‘I do’ in Milan! What fuelled the wedding rumours was the presence of Sharma family’s priest. Despite the grand destination wedding location, it will be a small affair. Only a handful of people apart from the couple’s families will be at the event. Virat’s childhood coach, Rajkumar Sharma will be attending. Some of Virat’s close friends will too be attending the wedding celebrations. Given the ongoing India vs Sri Lanka ODI series, Virat has not been able to invite most of his co-cricketers. As reported only Sachin Tendulkar and Yuvraj Singh will be able to attend the wedding. Currently, newly-wed cricketer Zaheer Khan is honeymooning in Maldives with his wife Sagarika Ghatge. ”Not many people have been invited, as it is a really small function. Just close ones are invited, Virat’s childhood friends and few of our family members. From cricket fraternity, only Sachin and Yuvraj will be seen, if they make it to the wedding. And of course, Virat’s coach Rajkumar Sharma who once taught him. There were others too but they can’t make it for the day,” said a source to MensXP. If believed, VVIP invitations have been sent to certain Bollywood celebrities. Anushka’s star-studded guest list includes big names. ‘Rab Ne Bana Di Jodi’ co-star Shah Rukh Khan, Aditya Chopra, ‘Band Baaja Baaraat’ director Maneesh Sharma, ‘PK’ co-star Aamir Khan! The exact date of the wedding date is still under speculation anywhere between December 12-18. After their wedding, the duo will register their marriage in Mumbai early next year in January. Reportedly, Anushka Sharma and Virat Kohli will host a lavish reception in Mumbai later in December. Also Read:Here’s Everything You Want To Know About Anushka Sharma-Virat Kohli’s Wedding In Italy! Previous articleHere’s The Real Reason Why Rajinikanth – Akshay Kumar’s 2.0 Has Been Postponed! Next articleExclusive Full Interview: Fukrey Returns’ Cast Makes Funniest And Quirkiest Confessions!